Happy new year to you! 2018 sure started with a bang, didn’t it? I had not intended to write much to introduce this newsletter, but I wanted to ask for your help. I was humbled to witness the dedication, hard work and commitment of the various shelter and homelessness charities. I’ve been constantly amazed by both of their staff and the countless volunteers during the cold snap the last three weeks – especially during the two winter storms. These people are selfless and work so hard to help provide safe shelter to the most vulnerable in our society. They do amazing work. 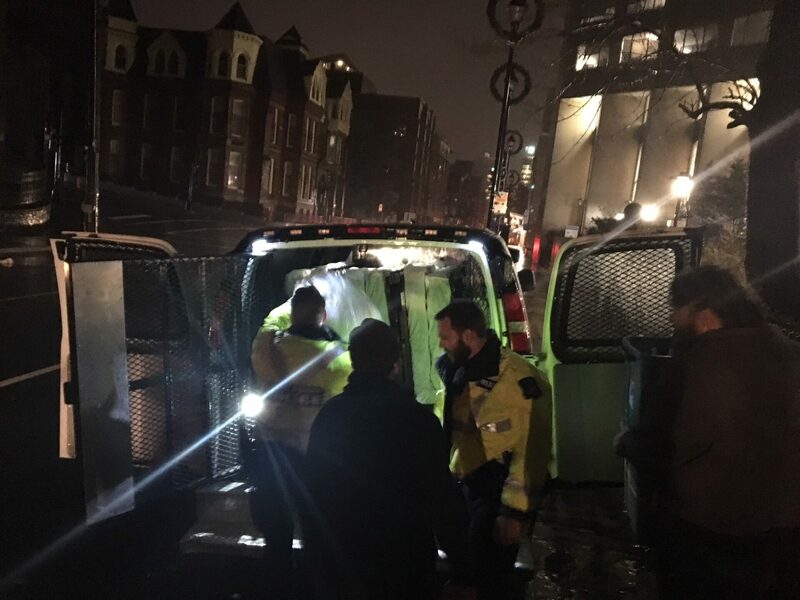 The picture above is of Halifax Regional Police (who were huge support) helping shelter staff load cots into police van to be moved to temporary emergency location during the height of the storm. This is just one example of the work these folks do. The recent winter storm caused unexpected operational costs for the various not for profits that operate the shelters in Halifax. Out of the Cold and the Warming Centre had to move temporarily, Phoenix House too had some damage to their siding, and usage was at 110% at all facilities. If you have a favorite charity you have donated to in the past, consider giving a little more as you are able. For the past couple of years, Inglis Street School has been working towards upgrading one of District 7’s playgrounds (next to our school) with the intention of creating a playground where children of all abilities can enjoy an inclusive and barrier free playground. 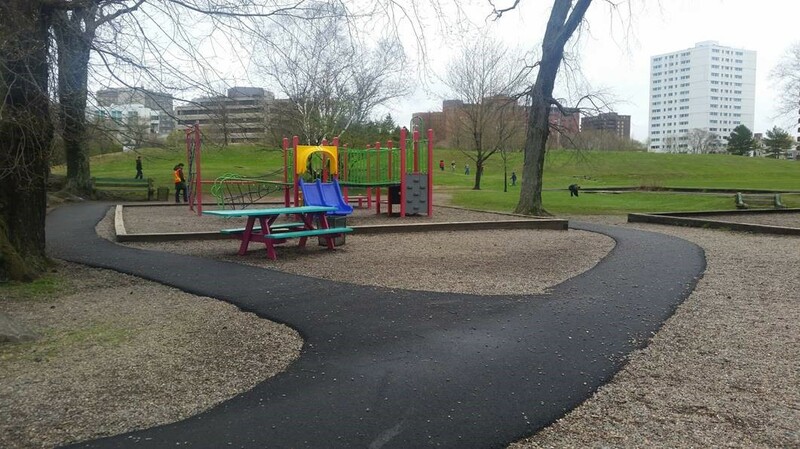 The first phase of the project was the construction of an accessible paved pathway leading from Inglis street elementary schoolyard to the Gorsebrook park playground. As a result of this, all children (including those with mobility challenges) living in District 7 as well as those attending the area schools and day care or visiting the IWK Health Centre can now more easily access the playground area. In the next phase the older play structure and swings will be replaced. Due to the substantial total cost of the project, along with the $30,0000 participatory funding obtained over the past two years, HRM has earmarked additional funds from a provincial grant which leaves us needing to fundraise at least an additional $15,000 to achieve the total amount required for this phase of the project, which includes; purchasing a new complete play set, additional adaptive play equipment to cater to the needs of children with disabilities, upgrading the surface of the playground and repairs to the surrounding paved areas. We are working closely with the HRM Parkland planning team towards the completion of this phase of the project by the end of 2018. We are looking for your community support for our upcoming fundraising events and fairs. We are kicking off this round of fundraising on February 8th at 6:30 pm at the Inglis Street Elementary School where we will be holding a DELICIOUS DESSERT AUCTION. Please stay tuned for more information on the next newsletter and our school website (http://www.ises.ednet.ns.ca). You can also consider a direct donation to the playground fund (we are collecting donations at the school’s main office – we will issue tax receipts). A public hearing has now been scheduled for Tuesday, January 16th, 2018, at 6:00 p.m. at Halifax City Hall (Council Chamber), 3rd Floor, City Hall, 1841 Argyle Street, Halifax, NS. Regional Council will consider the amendments to the Halifax Municipal Planning Strategy and Halifax Peninsula Land Use By-law contained in the March 31, 2017 staff report found below with the exception that the overall height of the building be limited to 62 meters. Official Opening Reception for the Atlantic Canadian debut of Body Worlds! This will be the first opportunity to see this highly-anticipated exhibit before it opens to the public. This exclusive event is only available to Museum Pass Holders and those who have purchased Advance Tickets. You can also purchase Museum Passes at the event. Be among the very first to see Body Worlds Rx! Do you want to have a say in new events for youth during the Halifax Pride Festival?!? Halifax Pride’s Youth Committee will have its first meeting for the 2018 festival in the Halifax Central Library, and all youth 19 and under are welcome to attend. This Youth Committee will focus on improving opportunities for young people at Halifax Pride and will develop a new youth focused event to be held during the Halifax Pride Festival. The Youth Committee will be responsible for deciding what the new event (or events) will be and identifying logistical needs. The Halifax Pride Society will provide financial support for the event(s) and a Volunteer Leader to help facilitate activities. In addition to event planning, the Youth Committee will also be asked to advise the Halifax Pride board on various other issues.